Family Heraldry - Origins of the surname Affleck. While there are a very large number of other heraldic symbols (particularly crests) which suggest some linkage with the Affleck surname or its many variants, the crest (left) and arms (below) are those which, over many centuries, have most often been associated with the Auchinleck /Aghlek/ Affleck name. Research on this continues. The Ear of Rye crest (seen left) has been around since at least the 1400s and has been identified with the Affleck family surname in Scotland, England and Ireland. There exist a number of different versions which seem to be based mainly on region. 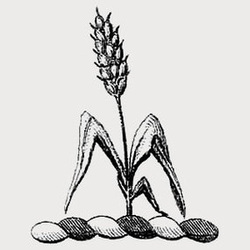 While a number of different arms have been associated with surname Affleck or its many variants over many centuries, the two arms seen here are those most often found associated with the family surnames. In Scotland, the Cross Embattled (seen left) is thought to be unique to the Affleck family surname, first being noted there in the 1440s at Glenbervie in Kincardenshire. Variations suggest, but do not prove, that it is probably considerably older than that period. It is also found quartered on several other Scottish family's arms, notably one of the Clan Douglas. It has appeared in both Angus and Ayrshire and a variety of other Scottish locations. 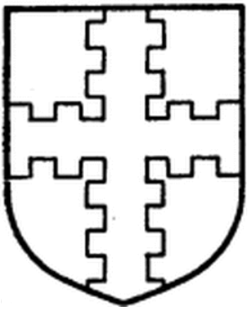 The Three Black Bars ( seen left) are perhaps the more widespread of the two arms shown here, appearing not only on various Affleck family arms but quartered on several other families arms, notably the MacVicars. Though noted as being associated with the Auchinleck name in Angus during the 14th or 15th century, the Bars were also held by the family surname in Ayrshire, possibly as early as the 12th century though that is not at all certain as yet. Where the arms appear in England, they are directly traceable back to the Auchinleck surname in Ayrshire where the English Affleck's originated. No example of the surname's Three Black Bars has yet been confirmed in Ireland.